Battersea Canoe Club Polo - As Seen on TV! 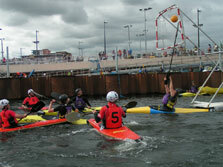 Canoe Polo: The fastest growing paddle sport in the world. Probably. It's a five a side game played in a swimming pool or outdoors on a lake. The goals are raised 2 metres above the water, so that a player under the goal can generally only just reach the top to stop any shots. The ball is moved around either by throwing hand to hand or by dribbling. Striking the ball with the paddle is allowed but is generally a silly idea as you're unlikely to keep control. Polo is a contact sport so you can push any player in control of the ball with the aim of capsizing them. Contact is only allowed between the shoulder and the elbow, or the back. There are quite a few rules in Polo, mostly focussed around not killing each other. In the main, paddles are for propelling yourself through the water, not for attempting to maim your fellow players. Also, holding people under water is not generally considered Kosher. 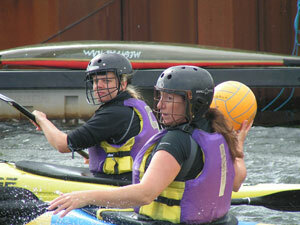 Above all, Polo is great fun, and accessible to any level of canoeist. In many ways, it's the ideal solution to keeping canoeing skills going whilst living in a city. Furthermore, Battersea's late session start means that it's easy to get down after work. We look forward to seeing you there. The 'Idiot's Guide to Canoe Polo' is basic description of the rules of Canoe Polo that takes 5-10 minutes to read. It was written in 2001 and so may not 100% up to date but most of it still applies and is still a good introduction to the rules of canoe polo for those of you who are new to the sport. The official rules which can be found in the BCU Canoe Polo Yearbook 2015. This is useful for those of you attending a refereeing course. It would take several hours to read thoroughly!